So far, 20 people have registered in honor of Calvin. You can too. Calvin. Described by so many friends and family members as kind, loving, cheerful, smart, friendly, witty, funny. . . the list goes on. He was not originally named after the “Calvin & Hobbes” comic strip (written by Bill Watterson) but when he received his first stuffed tiger at the hospital when he was born, our Calvin & Hobbes journey began. Calvin James Mosman is the Calvin from the comics incarnate – only maybe kinder and more generous. But just as clever, witty and full of life and the joy of living. 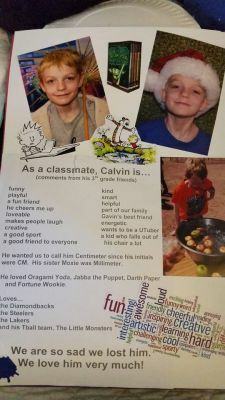 Calvin loves climbing trees, swimming, getting muddy/dirty, riding his bicycle, going to school (unlike his comic counterpart,) and, of course, playing with his stuffed tiger, Hobbes, as well as his striped kitty Hobbes. 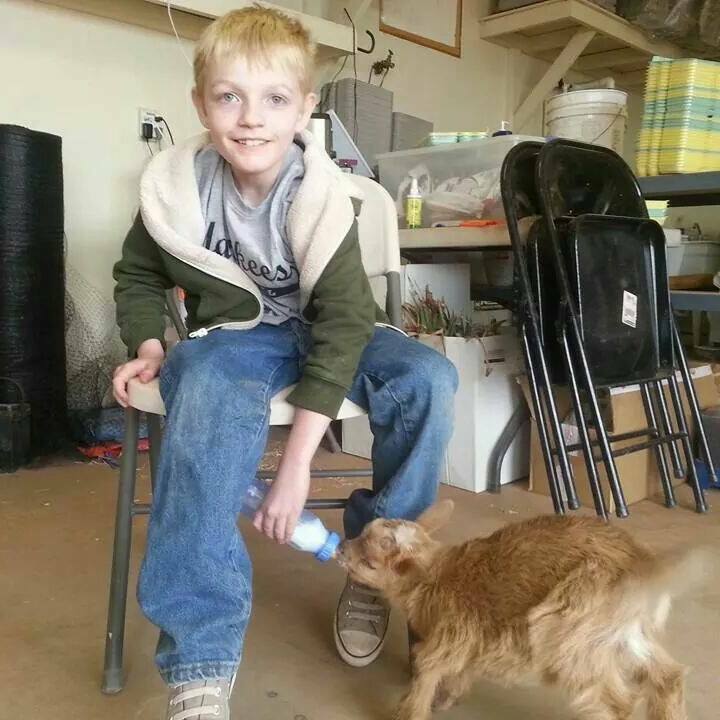 Calvin suffered a fatal asthma attack in May 2014 and later was declared legally brain dead. He lives on, not only through the gifts of his donations, but in our hearts and through all the memories and stories from the people whose lives he touched. Become a part of Calvin James Mosman's story. Click Here. We have been truly blessed by making connections with three of Calvin's recipients. So thrilled to know the people who have been touched by Calvin. https://facebook.com/CelebrateCalvin continues to document our journey. I met Calvin only once, at a local veterinary clinic where he and his mom were getting some of their critters taken care of. I was immediately impressed with how amazingly caring and loving this young man was. He was so very interested in animal rescue and I was surprised at the importance HE placed on making sure animals were spayed/neutered/vaccinated. He was so excited to tell me all about the dog that his family had adopted from the shelter I now volunteer in here in Benson Arizona. He struck me as an old soul in a young body with his wise beyond his years matter of fact way of explaining just exactly why they were at the clinic. When the news hit me that he had passed, it shocked me. I had just met him not long before that day and I felt like the world had lost a truly caring and loving young man. 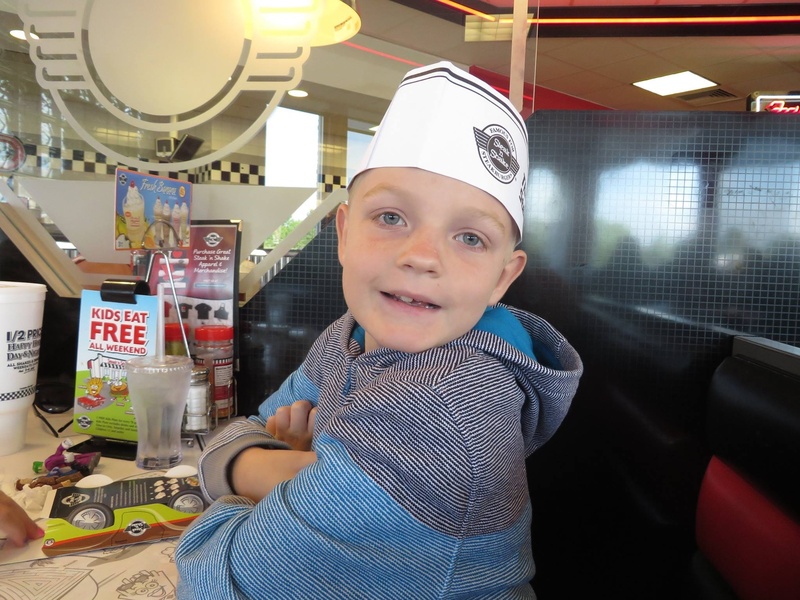 I will never forget this little man. And I have permission from Lisa to share how I met this hero. Calvin was my first pediatric code. I was just leaving the hospital and a code was called. I got to the ED right as the ambulance arrived. The awesome team of professionals from the ED and all over the hospital jumped into action and tried our hardest to save this little boy. We thought we got him back and he was sent to Tucson. I cried all the way home. Then I saw Calvin's FB page and followed every post. Every person in that ED that day was heartbroken when we found out that Calvin wasn't going to make it. Almost all of us are parents of kids, some of our little guys also have asthma. I am astounded every day when I think about everyone did what had to be done even though it hit so close to home. I got to know Calvin through his FB page and I am convinced as well that his little light is shining on especially in all the donor recipients. I started working at UMC at met the donor coordinator. She told me that families like the Mossman's and their beautiful decision to let a piece of Calvin live on are what makes her job feel so worthwhile. Calvin and family, you are so loved. Calvin's classmates made this for him. Calvin my Steak and Shake man!